The people of the area have flocked the house to see the child they believe to be an incarnation of Lord Hanuman. Being born with rare conditions can be challenging for the survival of a child, and it only gets worse in India since the lack of awareness about medical disorders creates a situation where the infant doesn’t get the sensitive treatment that it needs, and in many cases faces trouble from society. 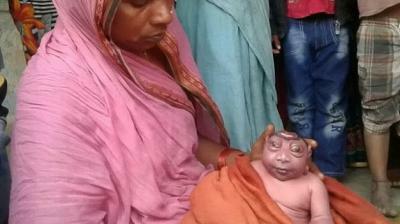 A similar case is being reported from Bihar’s Katihar, where a child born with thick skin and deformed features due Harlequin Ichthyosis is being branded an alien and also called supernatural by the locals. The child was born to 35-year-old Khalida Begum on Monday night, as she was shocked to see the small head and bulging eyes. Meanwhile villagers are thronging to the house to catch a glimpse of the child everyone is calling an incarnation of Lord Hanuman. This isn’t a first as several children with certain birth defects have been associated with supernatural beings due to lack of awareness.